MarVista Entertainment has announced today a partnership with IM Global Television to develop, co-produce, and co-finance a King Kong television series, which is completely unrelated to the recent Kong: Skull Island. Based on DeVito ArtWorks’ Skull Island property and Merian C. Cooper’s King Kong, King Kong Skull Island is a comprehensive King Kong Universe exclusively endorsed by Kong’s creator. The series is a serialized, contemporary continuation of the classic with a female-led, multi-cultural ensemble that delves fully into the wonders and horrors of Skull Island and its origins. Academy Award nominees Jonathan Penner and Stacy Title are attached as writers/executive producers. Dannie Festa (Trolls) of World Builder Entertainment will executive produce. “There’s clearly a deep and abiding interest in this timeless story. We love Stacy and Jonathan’s approach to this adaptation and look forward to partnering with MarVista as we bring this gripping tale of survival and adventure to life for a new generation of Kong fans,” said IM Global Television President Mark Stern. It is worth noting the the legal history of King Kong is an incredibly-complicated thing. In a world of fairly cut and dry “movie rights” like DC Comics or Marvel, King Kong has gone through an extensive battle in the court system with the character’s ownership divided across multiple parties: Time Warner own the rights to RKO’s original 1933 film and its sequel; StudioCanal own the international rights to the 1976 remake and its sequel, however Paramount Pictures owns domestic rights to the 1976 remake; Merian C. Cooper’s estate owns the book and publishing rights to the character; and Universal Studios own the majority of the rights to Kong, except (perhaps most importantly) the trademark to the character. In addition, the novelization of the screenplay to the 1933 film sits in the public domain, and is open to adaptation by anyone. It’s a veritable jungle. Furthermore, it is also worth pointing out that writer/artist Joe DeVito, of the aforementioned DeVito ArtWorks, previously sued Legendary Pictures, Warner Bros., and the producers of Kong: Skull Island for allegedly stealing his ideas in a defunct pitch for a Kong TV series. 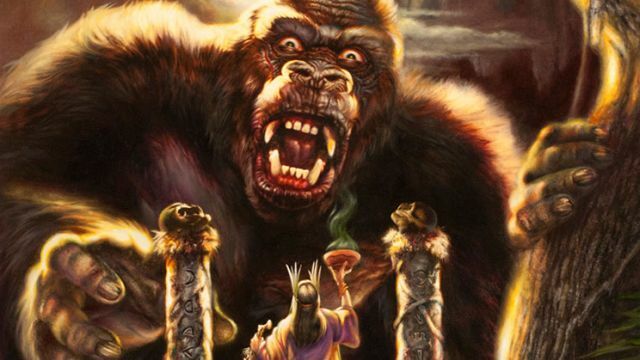 In 2004, with the permission of the Cooper estate, DeVito created and illustrated Kong: King Of Skull Island, a book that functioned as prequel/sequel to the original movie.